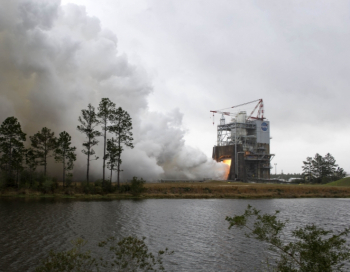 Personnel from NASA, engine prime contractor Aerojet Rocketdyne, and Stennis facilities contractor Syncom Space Services conducted the test firing, with ignition in the afternoon on February 22. Development engine 0528 was involved in the A-1 test stand. “It’ll be an events-driven countdown, like we usually do for a test,” Steve Wofford, manager of the SLS Liquid Engines Office, said in an interview with NASASpaceflight.com ahead of the test. The plan for the test called for a total duration of 380 seconds; during the test, the engine was throttled at 109 percent of its original power level for 205 seconds, at 100 percent for nine seconds, and at 80 percent for 118 seconds. The different throttle settings are required to meet a series of objectives designed for the test. A low-pressure fuel duct was also “green run” as an acceptance test of that engine component, qualifying it to enter the flight hardware inventory. The last RS-25 hot-fire test at Stennis was back in late August and at the time test firings at Stennis were planned to continue in the Fall of last year to begin green-running the new flight model ECUs that are being assembled by Honeywell at their Clearwater, Florida, facility. At the time, the first flight model controllers were expected to be available in the early Fall, but the controllers are just now starting to be shipped. “We are in the process of delivering our first flight box to qual [qualification] test (on February 17), so it’ll be coming up here to Huntsville for the hardware-in-the-loop lab testing and then it will go into formal qualification testing at Honeywell,” Mr. Wofford explained. That flight model ECU, FM1, should arrive in Huntsville this week. The second controller, FM2, is now scheduled to ship to Stennis in time for the next hot-fire test on March 24. 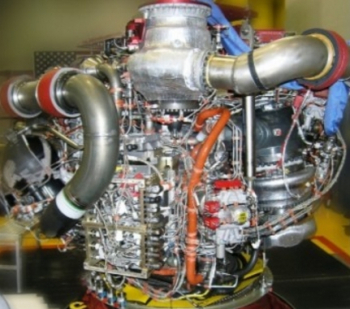 While waiting for the flight model ECUs, the Liquid Engines Office elected to go ahead with this hot-fire to evaluate a change request from the SLS Program. “The primary reason we wanted to get into test earlier rather than later is because we had a fairly recent “requirements change request” from the program,” Mr. Wofford explained. 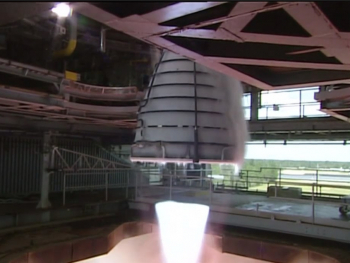 Testing of the RS-25, formerly known as the Space Shuttle Main Engine (SSME), began in early 2015 and a main objective was to qualify the existing design to operate in a significantly different flight environment. SLS is both physically longer and at times will accelerate faster during launch than Shuttle did, requiring different starting and running inlet conditions for the engines through powered flight. The SLS vehicle and flight designs continue to be evaluated in detail analytically as the program continues through Design Development Test and Evaluation (DDT&E) prior to its first flight. 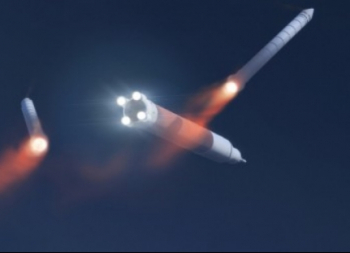 As the designs are being iteratively refined, analytical models are showing that maintaining the inlet pressure limits on the engines results in less structural margin on the forward solid rocket booster (SRB) to Core Stage attach struts than earlier predictions during a period late in the SRB burn. 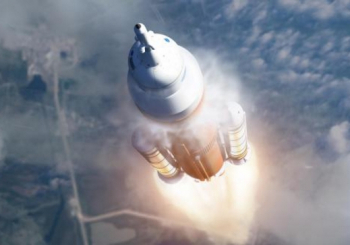 The time period of interest in the SLS flight profile for this case is near the end of the SRB burn. “At that point, the vehicle is accelerating to the point where it needs to throttle the engines in order to stay within that LOX inlet pressure requirement,” added Philip Benefield, Systems and Requirements Team Lead for the Liquid Engines Office. Incidentally, the engines were already planned to throttle down for a short period of time much closer to SRB separation for the opposite case. 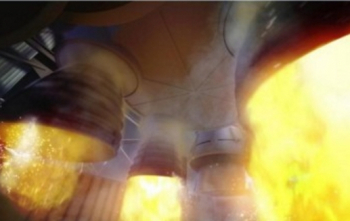 “At that point [the boosters are] almost dead weight – they’re tailing off, their thrust is going down very quickly and so at that point the boosters become the sagging object if you will,” Mr. Benefield explained. “Operating at that different set of inlet conditions so far outside of our [Shuttle] experience base is a really tremendous testament to RS-25’s operational flexibility,” Mr. Wofford commented. Including this latest hot-fire test, the current baseline plan has four more test firings with engine 0528 that would run into the Summer. Mr. Wofford is evaluating an option to do a fifth hot-fire on 0528 before it is removed from the A-1 stand to test other engines. Green runs of the new flight model controllers would be a main objective of those tests. As noted above, flight model controller FM2 would be attached to the 0528 engine for the next test on March 24 and then for each subsequent hot-fire a new flight controller would be rotated onto the engine in the stand for its green run. Controller FM3 would be green run in a test scheduled for April 27, then controller FM4 in a test scheduled for May 16. After each flight model controller is hot-fired in the stand, assuming it passes the test it will be taken to Aerojet Rocketdyne’s facility at Stennis and installed on one of the flight engines designated for the Exploration Mission-1 (EM-1) launch. Then the flight engine will be prepared to be shipped to the Michoud Assembly Facility (MAF) in New Orleans, Louisiana, for eventual installation on the first flight Core Stage. Mr. Wofford said that whether to hold the EM-1 flight engines at Stennis after the new controllers are installed for a while or ship them to MAF earlier is still being discussed. “We’re talking about it in the program and we can do it either way, it’s no big deal,” he added. Flight engines 2063 and 2062 are “new” – never acceptance tested; hot-firing them will help complete certification activities. Following the acceptance tests of the two flight engines, current plans are to begin testing affordability changes associated with the restart of RS-25 production. In addition to improved affordability goals, the engines will be certified to run at 111 percent of their original, early Shuttle-era power level. “The first round of that testing starts this year – this Fall – on engine 0528,” Mr. Wofford noted.